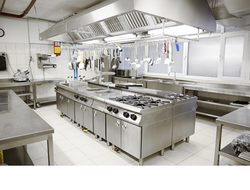 We have also achieved expertise in the sphere of manufacturing various Food Serving Equipments such as Chat Counter, Juice Counter, Pani Puri Counter, Buffet Counter with Sneeze Guard, Pick Up Counter with Heater Lamps, Hot Bain Marie, Cold Bain Marie and Tea / Coffee Dispenser. We are backed with efficient workforce who assists un in installation of these counters at our clients end. 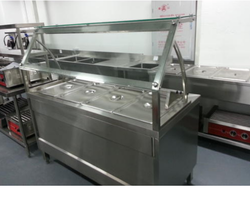 Fully SS make, with containers from 2 to 10, with under storage, electrically operated, tray railing, with sneeze guard. 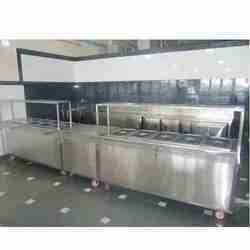 We also offer various kinds of Panipuri Counters that are widely demanded in various hotels, restaurants and other places. These are manufactured with the latest technology and have been appreciated for their convenient designs. These are properly designed to keep various types of fruits in a systematic manner providing. • Light weight but durable. Looking for “Food Serving Equipments”?